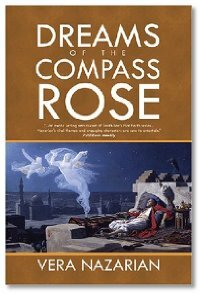 Dreams of the Compass Rose by Vera Nazarian. Missing, Presumed Undead by Jeremy Davies. Vera Nazarian talks to us this week about a host of books. One of which is, Dreams of the Compass Rose. Vera has written a lot of books. Tune in and hear about several of her favorites. After that, Jeremy Davies tells us about his e-book Missing, Presumed Undead. If you are looking for a new e-book title to drop onto your reader, this just may be the one. Draco-Vista Studio receives many new books each week. So, we just have to tell you about them. Evo steps back this week and lets Michael, Summer & Joe go off on Fox. Then they collectively toss it to the dragon. Great show guys!! Especially when you fed Fox to the Dragon for cancelling so many great Sci Fi show. Loved it!!!! Another great show. I keep meaning to email in my appreciation, but I listen on my weekly commute, and by the time I get home - I forget! Today, I remembered. You guys are the best - you were the first podcast I ever listened to (the only one that sounded interesting to me) and you're still my favourite. Keep up the great work - you make "getting there" all the fun!